This post contains information about the Post-Game Walkthrough for beginning the Ultra Beast quest, as well as the Rainbow Rocket episode. After finishing the Pokemon League, head out of your house. There will be a cutscene with the Ultra Recon Squad. One of the members will inform you about the Ultra Beast quest. Upon accepting the quest a cutscene will happen where Wicke informs you that she will be going to the Ancient Poni Path. After the cutscene, you will be given a Big Malasada, a Level 60 Type: Null and all the Type Memory Disks. Following this, head towards the Poni Grove. Upon entering Poni Grove, the members of the Ultra Recon Squad will quickly brief you about the Ultra Beasts. They will then give you 5 Beast Balls to help you capture the Ultra Beasts. Depending which version you’re playing, you’ll face Blacephalon (Pokemon Ultra Sun) or Stakataka (Pokemon Ultra Moon). Once you have finished the Ultra Beast episode, Sophocles will visit your home. He will ask you to go to the Pokemon Festival. Upon arriving, you will notice that the castle is now occupied by Team Rainbow Rocket. Enter the castle and speak to the Battle Agents’ counter. Choose to accept the challenge and a trainer battle will Happen. After winning the battle, Sophocles will ask you to push the “Eject” button. Doing so will trigger the Rainbow Rocket quest. Head to the Aether Paradise where there will be a cutscene with Wicke, who is on her way to the Team Rainbow Rocket’s castle entrance located at Lusamine’s house. Afterwards, Wicke will give you a Big Malasada. There will then engaged in a multi-battle against Faba and some Aether Foundation employees. Lillie will join your battle using a level 60 Clefairy. She will be buffing your team’s defenses with Reflect and Light Screen. Faba uses mostly Psychic Pokemon, so it is best to use Dark or Ghost-type moves dispatch them quickly. Using Grass-type moves on Claydol and Bruxish is also a good alternative. In order to defeat Faba’s teammate, use Steel or Poison moves on Granbull and Shiinotic, while use Fighting or Flying moves on Scrafty. After defeating Faba and the Aether Employee, head inside the Castle entrance. Move towards the back portion to trigger another cutscene. Head back to the entrance and battle all the Rainbow Rocket grunts. Once you’ve defeated all the enemies, head towards the east side and talk to Lillie to let her heal your Pokemon. You will then have to battle two Team Rainbow Rocket Grunts, but Guzma will help you defeat them. Once you’ve dispatched the grunts, talk to Lillie in the Mirror Door. Now, you will then have the chance to defeat all the bosses of the organizations from the previous games (i.e. Team Magma, Team Aqua, Team Galactic, Team Plasma, and Team Flare). Proceed to the room in the east and step on the warp platform. Left Warp Room 1 – Go to the door to your left, then head towards the warp room on the right side of the room. You will be greeted by a number of Team Rainbow Rocket Grunts. One of them will rush towards you, but after a few dialogue, they will all retreat. Head to the bottom warp room. Left Warp Room 2 – You will be transported to a room where the Team Rainbow Rocket Grunts are blocking the path to the Warp pads. Head to the bottom warp pad. Once in the middle part of the room, take the bottom warp pad again. Pick up the Guard Spec. and go to the warp pad near the leftside wall. Left Warp Room 3 – In the new room, you will battle a Team Rainbow Rocket Grunt. After defeating him, head towards the center warp panel. If you use the bottom warp pad, you can pick up a Rare Candy and a Hyper Potion. There is also an Electrode disguising itself as a Pokeball there. Left Warp Room 4 – In the next room, battle the other Team Rainbow Rocket Grunt. Once you defeat her, head back then go to the warp panel at the leftmost side of the room. Left Warp Room 5 – You will get to a room with a doorway that’s being guarded by two Team Rainbow Rocket Grunts. Grab the Full Restore then head towards the guards and defeat them. Afterwards, head towards the door. 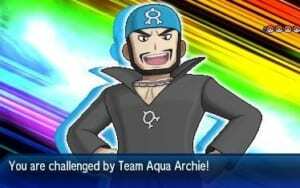 There you will battle an alternate dimension version of Team Aqua’s Admin, Archie. Archie uses predominantly Dark and Poison Pokemon, but he has Kyogre as his ace. Use Fairy or Fighting type moves on his Mightyena, and Electric or Grass moves on Sharpedo. Psychic and Ground moves make quick work of Archie’s Muk, while Crobat is susceptible to Psychic and Electric attacks. Kyogre has high HP stats but is susceptible to Grass and Electric moves. However, be careful when using Grass-type Pokemon against Kyogre, since it has Ice Beam that deals massive damage. Also, remember that Kyogre’s Drizzle strengthens Water-type moves. After you defeat Archie, examine the painting. There will be a switch there. Press the switch to activate the Warp platform and return to the area where Guzma is guarding the big door. Enter the big door and talk to Lillie to have her heal your Pokemon. Leave the room, and head towards the right side of the area where Guzma is. Head to the warp platform to get to the room that has a black pillar in the middle and a Team Rainbow Rocket Grunt stationed on the top wall. Defeat the Team Rainbow Rocket Grunt. Examine the black pillar. It will light up the four slates in the room in a certain fashion. Memorize the pattern and step onto the slates to activate the warp platform on the right side of the wall. Warp Room 1 – Examine the black pillar and memorize the pattern again to activate the warp platform. Be sure to remember the pattern, as the Team Rainbow Rocket Grunt will try to distract you. Grab the Full Heal before heading towards the platform. Warp Room 2 – Memorize the pattern to activate the platform again. Warp Room 3 – If you go to the platform on the right side of the room, you’ll head to Warp Room 5. There will be an Electrode on the upper left side, disguising itself as an item. If you want to battle it, examine it. Go to the platform between the two Team Rainbow Rocket Grunts to get to Warp Room 6. Warp Room 6 – This room will have two Team Rainbow Rocket Grunts who are guarding a big door. Before battling them, grab the Full Restore on the left side of the platform. After defeating the guards, heal up your Pokemon and enter the room. 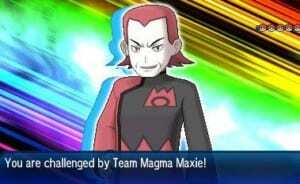 There you will battle Team Magma’s Leader, Maxie. Use Fairy, Fighting or Bug moves against Maxie’s Mightyena. For Weezing and Crobat, a Pokemon with good Psychic moves will quickly mow them down. Finally, for Camerupt and Groudon, use Water-type moves to defeat them in quick fashion. Once you’ve defeated Maxie, examine the painting again and press the switch. This will open the gates on the room where Guzma is guarding. Use the warp platform to teleport yourself back to the room where Guzma is. When you get there, Guzma will be handling two Team Rainbow Rocket Grunts. Talk to Guzma and he’ll ask if you found the Team Rainbow Rocket boss. Choose the first option, and one of the Grunts will tell you that you’ll need to get the key card and activate the switch in order to cross the mirror door. After a shot cutscene, you can choose to either go to the left side or right side. It is best to talk to Lillie again to heal your Pokemon before venturing out to one of the top floors. Left Stair Warp Room 1 – After going up the left staircase, you’ll encounter a room with a Team Rainbow Rocket Grunt patrolling. You can either fight the Grunt or head towards the warp platform. Left Stair Warp Room 2 – Go through the floor tile with the arrows pointing to the left side (the fourth tile down from the fifth column). This will lead you to the room’s warp platform. Left Stair Warp Room 3 – In the next room, head towards the floor tile two spaces above the warp platform. Then, step on the floor tile above you. Finally, make your way to the floor tile beside the obstacle to reach the next warp platform. Left Stair Warp Room 4 – In the next room, step on the floor tile that’s pointing to the right on the upper right side of the warp platform. Next, step on the tile that’s pointing towards the top. Step on the tile close to the obstacle to reach the warp platform. You’ll then be in a room where two Team Rainbow Rocket Grunts are guarding a big door. Grab the Hyper Potion to your left first before you battle them. After defeating them, head towards the door to battle Team Galactic’s Leader, Cyrus. Before battling, Cyrus will ask you a question. Select which answer you want to start a brief cutscene. After that, the battle will commence. Use Ground or Water-type moves against Houndoom to defeat it quickly. For Honchkrow, Electric moves work best, since it’s a Flying type; the same goes for Crobat. Weavile is especially susceptible to Steel and Fighting moves, being a Dark and Ice type. Finally, Cyrus will have Palkia as his Legendary Pokemon in Pokemon Ultra Sun. It is weak against Dragon, Fairy and Electric type moves, but it has some coverage moves such as Earth Power, so be cautious which Pokemon you’ll use to fight it. In Pokemon Ultra Moon, Cyrus will use Dialga. This legendary Pokemon is weak against Fighting and Ground type moves. After defeating Cyrus, he will give you the Galactic Key. Use it on the machine on the wall. This will activate the mirror door. Head back to the warp platform to return to the area where Guzma is. Head off to the staircase on the right side of the main room. Step on the warp platform to reach a room with red Meowth statues. Be careful not to cross them while the statue is looking directly at you since it will make you return to the warp platform. Examine the back of the statues to have them face in a certain direction. Right Warp Room 1 – Examine the Meowth statue that’s near the middle part to have it face towards the top side. Do the same with the Meowth statue near the right side wall. Afterwards, go to the warp platform. Right Warp Room 2 – Examine the Meowth statue closest to the right side wall to have it face the top side of the room. Afterwards, examine the Meowth statue near the warp platform where you came from. This will allow you to use the platform and go to the next room. Right Warp Room 3 – Examine the topmost left Meowth statue, and finally, examine the Meowth statue that’s facing the warp platform to go to the next room. Right Warp Room 4 – In the next room, examine the Meowth on the left side near the platform where you came from. Afterwards, examine the statue in the middle. Afterwards, examine the statue that’s on the right side of the platform where you came from. This will allow you to use the platform on the top side of the room. Again, you’ll be teleported to a room with a big door that’s guarded by two Team Rainbow Rocket Grunts. Get the Max Revive to your right before you defeat them. Afterwards, head to the room to battle the Team Flare leader, Lysandre. After a brief introduction, Lysandre will let you choose between the blue button and the red button. No matter what button you choose, you will have to battle him and pick the other button in order to stop his ultimate weapon from firing. Lysandre’s Pokemon predominantly consist of Flying types, with his Pyroar and Mienshao rounding off his team. Use Psychic or Flying moves on Mienshao, then Ground or Water moves on Pyroar. For Honchkrow, use Electric or Rock attacks. When he uses his Gyarados, he’ll transform it into Mega Gyarados immediately. This will change its type to Dark Water. It is best to use Electric moves to defeat it. Finally, For Pokemon Ultra Moon, Yveltal will be Lysandre’s Legendary Pokemon. It is a Dark Flying legendary Pokemon. As such, it is best to use Electric or Rock type moves to beat it quickly. For Pokemon Ultra Sun, Xerneas will be his Legendary Pokemon. It is a Fairy-type legendary Pokemon, so use Steel and Poison Type moves to defeat it. After the battle, press the button you did not press before you fought Lysandre to activate the Mirror Door and the warp platform. Head towards the warp platform, then go to the room where Lillie is. The Mirror Door will now be activated. She will heal your Pokemon first before you go to the Mirror Door. However, before you can go through, another Team Leader will block your path. Ghetsis will suddenly appear from the Mirror Door and comment about the other Team Leaders’ inadequacies in dealing with you. Afterwards, you will need to defeat him in order to use the Mirror Door. Ghetsis’ team consists of high HP and high-damaging Pokemon. Use Dark moves on Cofagrigus, and Fighting moves on Bouffalant and Bisharp. For Hydreigon, use Dragon or Fighting moves to defeat it. Fairy type moves are especially effective against Hydreigon. Finally, Ghetsis uses Reshiram as his Legendary Pokemon in Pokemon Ultra Moon, while he uses Zekrom in Ultra Sun. Use Dragon, Fairy or Water moves against Reshiram and Ground, Rock, Fairy and Ice moves on Zekrom to defeat it. After the battle, Ghetsis will use Lillie to make you give up your Pokemon. Choose the “I refuse” prompt. Afterwards, Colress will rescue Lillie and teleport Ghetsis away. Once the cutscene is finished, talk to Lillie to let her heal your Pokemon then head towards the Mirror Door to battle the final boss of the Team Rainbow Rocket Episode. Upon entering the Mirror Door, there will be a long cutscene with Team Rainbow Rocket’s leader, Giovanni. After he reveals his plans, you will then battle him. Giovanni’s team consists mainly of Ground type Pokemon, with the exception of Mewtwo. For Nidoqueen and Nidoking, you can also use Psychic moves. When he is down to Mewtwo, he will immediately evolve it to Mega Mewtwo. For Mega Mewtwo X, use Fairy, Ghost, or Flying type moves to defeat it. For Mega Mewtwo Y, use Dark or Ghost type moves. After you defeat Giovanni, he will leave Aether Paradise and return to his world. Team Rainbow Rocket’s castle will also vanish, and Lusamine’s room will revert back to its normal form. Another cutscene will happen with Guzma, Corless and Lusamine. This is then followed by another cutscene outside Lusamine’s house. Vicke will give you 55 Big Nuggets for completing the Team Rainbow Rocket Episode. Well how do I start the arc? I finished and I started back at my house and walked outside to talk to Hau and The Recon squad and pressed no to what they asked. Now idk how to start it up. When battling Maxie, Groudon is just a ground type not a ground and fire. That was very helpful because I thought zekrom and his other five Pokemon will differ me P.S I have been playing this game only four 2 weeks. I’m a huge Pokemon fan. Yeah same problem. A little frustrated but pulled through with the Pokémon I had in my team. do you only have to do one route or do you got to do both of them? Hi Dasiy, you have to do both routes. When i beat maxie and archie i went back and guzma is not choking the rr members so how do i progress I checked everything and it was correct so is this a glitch or am i doing something wrong???? anyways plz help me!???????? Did you press the switch under the paintings behind them? I beat Maxie before Archie, and now I can’t even find Archie’s route…what do I do? Did you hit the painting in Maxie’s room? Cyrus has a Dialga in Ultra Sun and a Palkia in Ultra Moon. It really surprised me when he sent out Palkia instead of Dialga while I was playing Ultra Moon. Might want to change that. Hi Taco Cat, we have updated the information, thank you for pointing that out. Hey,I battled Cyrus on Ultra moon and he was using Palkia and not Dalgia. I believe that information was wrong.